Using the kdump service and the kexec command, you can ensure faster boot up and creation of reliable kernel (vmcores) for diagnostic purposes. • kexec: The kexec command is a fast boot mechanism that allows booting a Linux kernel from the context of an already running kernel, without going through the BIOS. Starting from the BIOS can be very time consuming especially on the big servers with lots of peripherals. Bypassing it can save a lot of time for developers who end up booting a machine numerous times. • kdump: The kdump service is a kernel crash dumping mechanism that is reliable because the crash dump is captured from the context of a freshly booted kernel and not from the crashed kernel. 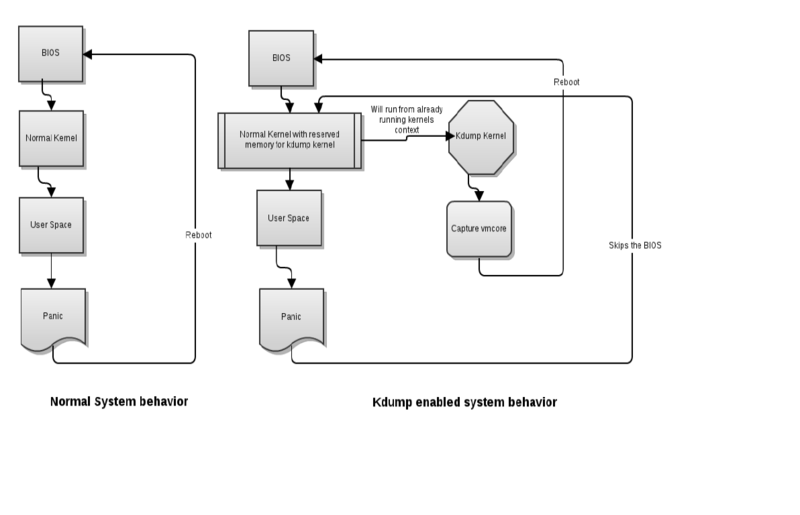 Kdump uses kexec to boot into a second kernel whenever the system crashes. This second kernel, often called a capture kernel, boots with very little memory and captures the dump image. The first kernel reserves a section of memory that the second kernel uses to boot. Kexec enables booting the capture kernel without going through BIOS hence the contents of the first kernel’s memory are preserved, which is essentially the kernel crash dump. Kdump is supported on the i686, x86_64, ia64 and ppc64 platforms. The standard kernel and capture kernel are one in the same on i686, x86_64, ia64 and ppc64. How Kdump Collects the Kernel Crash Dump? The main difference between chroot and pivot_root is that pivot_root is intended to switch the complete system over to a new root directory and remove dependencies on the old one, so that you would be able to unmount the original root directory and proceed as if it had never been in use. chroot is intended to apply for the lifetime of a single process, with the rest of the system continuing to run in the old root directory, with original root file system being unchanged when the chrooted process exits. This package is not necessary (and in fact does not exist) on other architectures. For i386 and x86_64 architectures on RHEL 5, edit /boot/grub/grub.conf, and append crashkernel=128M@16M to the end of the kernel line. For RHEL 6 i386 and x86_64 systems, use crashkernel=128M. Please note that using @16M at the end of the line on Rhel6 has caused kdump to fail. And It may be possible to use less than 128M, but testing with only 64M has proven unreliable. Starting with RHEL7 kernels crashkernel=auto should be used. The kernel will automatically reserve an appropriate amount of memory for the kdump kernel. Keep in mind that it is the best effort memory reservation and might not meet the needs of all systems (Especially for configurations with lots of IO cards and loaded drivers). So always make sure that memory reserved by crashkernel=auto is sufficient for the target machine by testingkdump. If it is not, reserve more memory by syntax crashkernel= XM (X is amount of memory to be reserved in megabytes). base memory to be reserved = 160MB an additional 2 bits added for every 4 KB of physical RAM present in the system. So for example if a system has 1TB of memory 224 MB is the minimum (160 + 64 MB). This will overwrite any data that was previously on the device. will mount the device that is ext3 with the label `/boot` and use that to dump the core. will dump the vmcore to /usr/local/cores/ instead of the default/var/crash/ location. This will dump the vmcore to /export/vmcores/**-**/ on the servernfs.example.com. The client system must have access to write to this mount point. When dumping to a network location over a bonded interface, it may be necessary to define the bonding module options in the kdump.conf file. Please note that kdump doesn’t accept module options from ifcfg-* files, because In the kdump kernel all modules are loaded prior to the network being started and thus the options can’t be set from ifcfg-\* files. In this case, kdump will use scp to connect to the crash.example.com server using the kdump user. It will copy the vmcore to the/var/crash/**-**``*/* directory. The kdump user will need the necessary write permissions on the remote server. Additionally, when first configuring kdump to use SSH, it will attempt to use the mktemp binary on the target system to ensure write permissions in the target path. 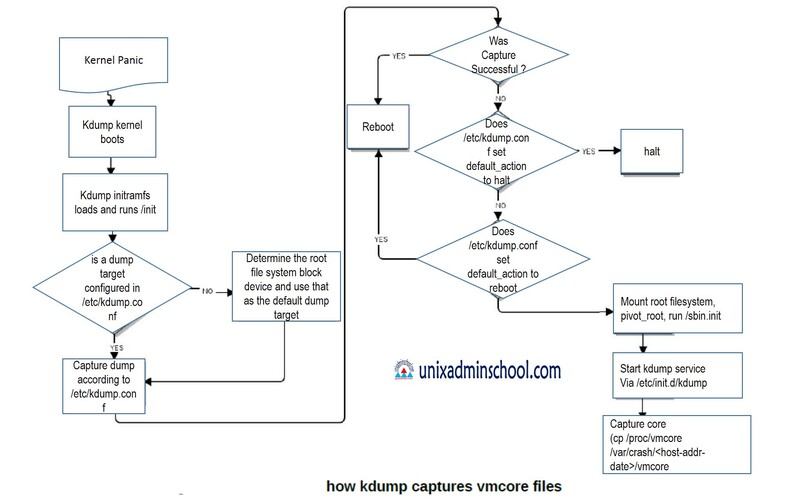 If your kdump target server is running an operating system without the mktemp binary, you will need to use a different method to save a vmcore to that target. Now try logging into the machine, with:   "ssh 'root@crashtarget"
Make sure the free diskspace of the partition or network location which you specified for storing the vmcore is at least larger than the whole physical memory on this system. Make sure sysrq is enabled and test the crash. WARNING! This will crash the system, so do it at a planned time if this a production system. Once the system boots back, check to confirm that it worked. Note: This is a workaround method therefore it depends on each environment. Please just refer to the following method. This method is not supported by Red Hat. Note: Checking environments is below. Note: This method is supported by Red Hat. Please read below sentences. This configuration is only vaildate from kexec-tools-2.0.0-245.el6.x86_64 version,if user uses old kexec-tools package,user can not use multipath device for kdump. Check uuid with blkid command. Restart kdump and chkconfig on. Make sure sysrq is enabled and test the crash. This will crash the system, so do it at the right time if this a production system. This article is to explain the procedure to backup and restore a RHEL server for the purpose of Disaster recovery situation. For the purpose of simplification we will be backing of the entire server data into an additional disk of the same server. But in real time scenarios, the backup should be taken to a remote server / tape/ backup device. 1. We are going to backup and restore the data to same server with same disk configuration. 2. We are not making any change to partition table or MBR ( Master Boot Record) , and so we are not taking backup of the MBR. 3. If you want to restore data to a complete new disk, you must recreate the partition table as per the original server, otherwise the server wont’ boot. 4. We are assuming that our Linux server having only non-LVM root partition. If your server is having LVM root file system, then the procedure will change a little bit before you start the restore. Note: In this example, we will use the /dev/sda6 partition to save backup files, and we assume that /dev/sda6 is mounted on /backup-files. Select/highlight the desired kernel using the up/down arrow keys. Press the letter a to modify the kernel line. On the new screen, press the spacebar to add a space, then type the letter s and press Enter. This will boot the system into single user mode, i.e. the boot process will stop immediately after execution of rc.sysinit and present a root BASH shell. If the system has been running for a long time, it is advisable to run e2fsck on the partitions before backup. Please note that “dump command ” should) not be used at heavily loaded and mounted filesystem as it could backup corrupted version of files. We can simulate a disk failure by using fdisk to delete the partitions that have been backed up. Get the first disc of installation media for the major version of the installed Red Hat Enterprise Linux (or the binary DVD). Note: boot.iso can be used for booting instead of the installation media, but the installation tree (including rescue programs) is still needed in HTTP server or anywhere. once the system has successfully booted from the ISO image and Red Hat Enterprise Linux boot screen will appear. Type: linux rescue without the quotes, and hit enter at the prompt. Select: Continue when prompted to allow the rescue environment to mount Red Hat Enterprise Linux installation under /mnt/sysimage directory. Run the command chroot /mnt/sysimage and then chroot to your system image. Notice: When rebuild all the partitions, please use the same “Start” and “End” number as before. Create New filesystem on top of sda1, sda2, sda3 and sda5 by using the mkfs command, as shown below. Note: DO NOT format /dev/sda6 because it saves backup files. So they match how they were before. This step is important for the restore to work. You should then copy /root/partition-sda.img to some other storage, for example a portable USB disk. If the partition is damaged and needs to be restored from backup, please connect your USB disk to the server and boot the server with installation media and enter rescue mode. Do not mount the root partition at this time – select “Skip” when the system asks if you want to mount the root partition on /mnt/sysimage. The MBR (Master Boot Record) occupies the first 446 bytes of the disk while the partition table occupies the next 64 bytes. We can use “dd” to dump the range from 447 – 510 bytes in the first sector. You should then copy /root/partition-sda.img to some other storage, for example a portable USB disk. If the partition is damaged and needs to be restored from backup, please connect your USB disk to the server and boot the server with installation media and enter rescue mode.